TRIVIA of Noh : Q127 : What are the origins of the designs of kendai? | Home | Trivia | Q127 : What are the origins of the designs of kendai? What are the origins of the designs of kendai? Kendai are a form of bookrest, or stand, used for keeping the score open during chanting. Each school has its own distinctive design, which is engraved on both sides. The symmetrical patterns feature elements from the crests of the school’s head family. 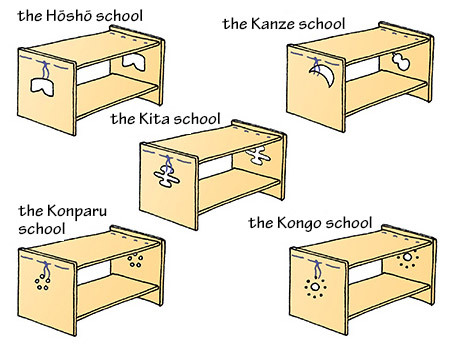 These include shippō (the seven treasures) for the Hōshō school, gosei (five stars) for the Konparu school, kuyō (the solar system) for the Kongō school, and kita-gasumi (haze) for the Kita school. For the Kanze school, the pattern on the left side shows the moon slightly in eclipse, with a gourd on the right side. It is said that these patterns refer to a farewell poem composed by the ninth head of the school, Kanze Kokusetsu: “Waga yado wa kiku wo makagi ni tsuyu shikite tsuki ni utafuru hyōtan no koe (At my residence, chrysanthemums are blooming full of dew on the fence, and gourds are singing under the moon).” Kokusetsu, who served Tokugawa Ieyasu, the first shogun in the Edo era, from a very young age, is known as the restorer of the school and laid the foundations for its subsequent growth. In the poem, he left an instruction that actors should expand their bellies like gourds and chant moderately with pursed mouths. The aim of the patterns on the bookrest is to remind the school of his instruction. The injunctions of people from earlier times live on today, even in everyday items. According to “Koshikata” (published by Wanya Shoten), an essay by Kondō Kenzō, an actor in the Hōshō school, the moon and gourd pattern was once used for the bookrests of all schools, including the Hōshō. It was only after the end of the Meiji era that each school began to use its own pattern, as they do today, and it was even later when the practice became established.